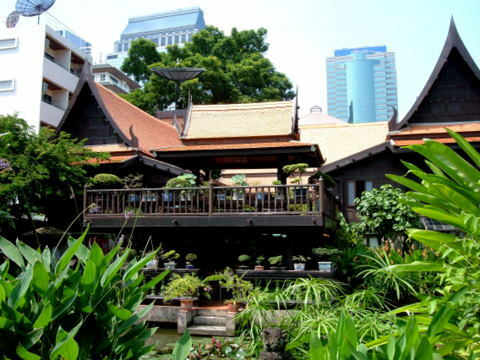 The Home of M R Kukrit Pramoj, officially known as M R Kukrit's Heritage Home, is set deep in a quiet soi off the busy South Sathon Road in downtown Bangkok. M R Kukrit's home consists of five teak houses, the earliest of which is more than 100 years old. An additional structure, the public functions hall was added later. The original houses for the Home of M R Kukrit were acquired from various parts of Central Thailand, dismantled, transported and painstakingly reassembled in the present location. Please see map to the heritage home. The whole process from the first house till completion took twenty years. These authentic Thai houses are based on the traditional Thai architecture of the central region. Traditional Thai houses are made from wood, held together by wooden joints or pegs. No nails are used. Such houses can be dismantled and reassembled somewhere else. So it's a real case of house moving. Let's take a quick tour of the Home of M R Kukrit Pramoj. On passing the main gate, visitors will see a reception hall on the right. This used to be the public functions hall that was built later. The hall was used for religious ceremonies, official receptions and banquets. There's a raised platform in the centre for the traditional Thai Khon Dance.The ornate masks for the dancers are arrayed in shelves, the demons' masks to the right and the masks for humans on the left. Frames above the stage display paintings by students of the Silapkorn University of Fine Arts. The artefacts in this hall include a Chinese altar presented by the Chinese leader, Deng Xiaoping and old Buddhist scripture cabinets dating back to the early Rattanakosin period. The boards at the other side of the hall display the life history and achievements of M R Kukrit Pramoj who was the 13th Prime Minister of Thailand. 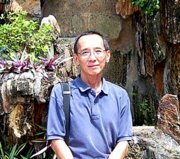 A man of many talents, M R Kukrit was also a prolific writer who penned the famous Thai classic Four Reigns. 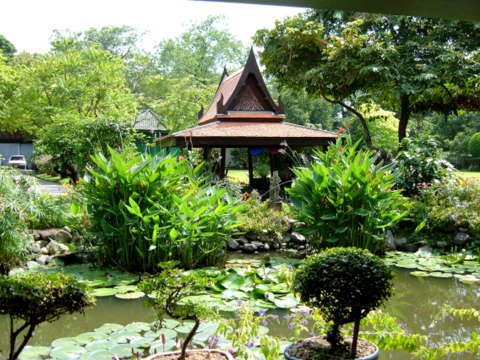 In most traditional Thai houses, the garden forms an integral part of the overall design and décor. The Home of M R Kukrit is no exception. Beyond the hall is a neatly kept garden of Thai bonsai plants, with a fountain as the centrepiece, another aspect of the nature of the former owner. The garden is flanked by two low walls joining the hall in front to the cluster of main houses to the rear. This gives the impression of a single integrated complex rather than a cluster of separate houses. After the garden, stand the five elevated teak houses connected by an open verandah. 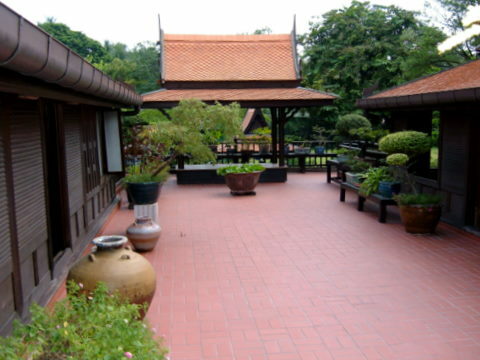 The open area beneath the houses, a typical feature of traditional Thai houses, is used as a dining and reception area for friends and students. On a showcase behind the dining area stand two vases presented by Mao Zedong. The owner's love for dogs is evident by the watercolour portrait of him with his two favourite dogs. The working table and chairs to the rear of this area have been carefully preserved complete with the scratches and nibble marks left by his pet dogs. The floor above is the centrepiece of M R Kukrit's home, the five teak houses connected by an open verandah. To the front is the formal reception house, the first to be built. It's carefully preserved with a wooden bed belonging to King Rama II together with cabinets neatly displaying bowls for betel nuts, food and desert popular during that era. To the left of this reception room is the living, reading and music room and to the right, the shrine room for prayers on holy Buddhist days. Along one side of the open verandah is the bedroom divided into sleeping, dressing and prayer areas. Within are cabinets displaying ivory boxes popular during the reign of King Rama V.
Across from the bedroom is the library filled with the English books used by M R Kukrit during his days at Queen's College, Oxford University. Photos in the library of M R Kukrit's paternal and maternal grandfathers, give an indication of his Chinese ancestry. The conference table in the centre of the room must have seen a number of momentous political meetings held during the many crises in Thai politics. A bird pavilion stands to the rear of the verandah that overlooks the huge garden with a pond and music pavilion. The Home of M R Kukrit provides a beautiful haven in a bustling city. 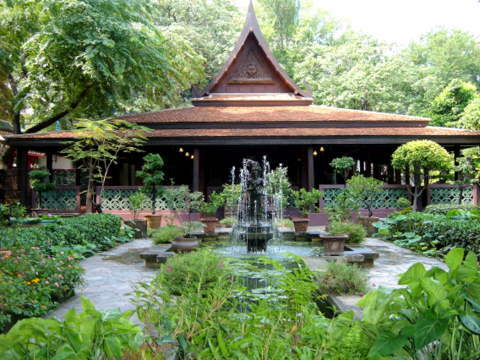 The Home of M R Kukrit Pramoj is a legacy of Thai architecture, history and art – a legacy preserved for posterity. This is sad news indeed. On 14 June 2007, it was announced in the press that the Home of M R Kukrit Pramoj is going to be closed to the public by the end of June 2007. Apparently there are differences between the current owner, M R Kukrit's son and the foundation running the museum. There's been an abrupt turn of events. M L (Mom Luang) Rongit Pramoj, the son of M R Kukrit Pramoj, announced a day later that the Home of M R Kukrit Pramoj will remain as a museum. This is in accordance with his father's last will and testament. The only difference is that the Kukrit 80 Foundation, set up on the 80th birthday of M R Kukrit, will no longer run the museum or conduct its educational activities on the premises. The foundation has managed the home since it opened in 2001. The source of the conflict seems to be the large pack of stray dogs adopted by M L Rongit in the home, which some foundation members felt were disruptive to their activities. Whatever the reasons, we’re glad the museum is here to stay and so will the dogs. 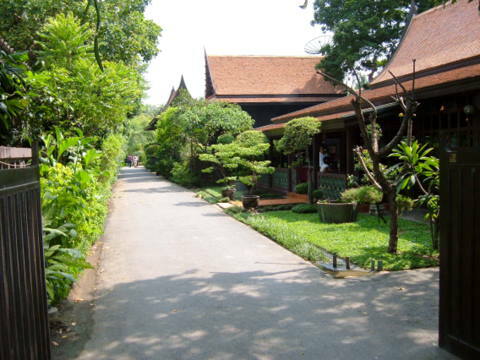 The heritage home is in 19 Soi Phra Pinit, off South Sathon Road. If you're coming from South Sathon, turn left at Soi Sathon 3 (or locally known as Soi Suan Plu). The junction is 150 m after the Australian Embassy. There's a Shell gas station just before the junction. After 100 m on Soi Sathon 3, turn right at Soi Phra Pinit. Keep going along this soi till you get to the Home of M R Kukrit. If you coming from Narathiwat Road, turn left at Soi Narathiwat 7 which is 250 m from the Sathon-Narathiwat junction. The home is about 200 m into the soi. The nearest Bangkok skytrain station is 450 m away from Soi Narathiwat 7 at S3 Chong Nonsi station in Narathiwat Road. If you are taking the skytrain, after you have alighted from the train, walk towards the Sathon-Narathiwat intersection via the overhead bridge. This pedestrian bridge will take you across the intersection where the Bank of China building is located. Get off the bridge at this building, then walk along Narathiwat Road till you get to Soi Narathiwat 7. If you are an independent traveller, here's a handy e-guide book, Tour Bangkok Legacies that will help you along as you explore the streets of Bangkok and discover its old treasures. It's complete with historical descriptions, maps and detailed directions on how to get to these places.